Wright Mills' book,The Power Elite (1956), indicates that the key to understanding American concerns lies in the over-organization of its society. Thus, the establishment is "the elite group formed by the union of the political, military, economic, university and mass media sub-elites of the USA” and lobbies of pressure that are interconnected by "a restless alliance based on their community of interests and directed by military metaphysics.” This concept is based on a military definition of reality and transforms the economy into a permanent economic war whose paradigm would be Rockefeller’s.This means full participation in the financial, military, and, “Jewish industry” one of whose members, David Rockefeller, would be the impeller of the Trilateral Commission(TC) or Trilateral (1973). Yet Donald Trump, a candidate who in principle is totally refractory to party discipline and has become the "black sheep" of the establishment, was finally elected President of the United States in the November presidential elections. His surprise triumph along with that of Brexit will mark the end of the "stage" of the teleological "scenario in which the purpose of the creative processes were planned by finite models in which the intention, the purpose and the anticipation and its substitution by the ‘teleonomic scene’ [are] marked by extreme doses of volatility” that will affect in a special way the New World Geopolitical Order. With Trump, we will witness the termination of the United States’s unipolarity and its role of global gendarme and its replacement with the new doctrine of Multipolarity or “Geopolitical Inter-Pairing” formed by the troika of the US, China, and Russia (G3). The EU, Japan, India and Brazil will be guests of stone in the new geopolitical scenario. Thus, in a speech given by Trump at the headquarters of the influential political magazine The National Interest, Donald Trump presented the main lines of his foreign policy that could be synthesized in his motto “America first", which de facto means the return of economic protectionism after canceling the Free Trade Agreement with Canada and Mexico (TLCAN) as well as the TTIP and the Transpacific Partnership (TPP), i.e., the central piece of the Obama Administration in its policy of reaffirming economic power and military supremacy in the Pacific region. This would be a direct hit on the geopolitical interests known as the "club of the Islands" with assets of around € 10 trillion and whose head, according to the Russian spy Daniel Estulin, is the financial and expert designer of “color revolutions”,George Soros. On the other hand, in an interview with the American TV channel ABC, President-elect Donald Trump expressed the idea that "NATO is obsolete, does not serve to combat terrorism and costs too much to the US", demanded that the European countries that are members of NATO "pay their share" because the economic contribution of these European countries is be a meager 2% of the national GDP, leaving the bulk of the funding in the hands of the US (70% of the total budget). Trump also denounced the "excessive amount of weaponry currently circulating in the world" which would imply the assumption of the US isolationism on the military level, and the enthronement of the G-3 (USA, Russia and China) as "primus peer" in global governance. This would mean the suspension of the US nuclear program with a duration of thirty years and a cost of a Billion $ as well as the stoppage of the system designed to detect cruise missiles in US territory (JLENS) so it would be a missile on the line Of the military-industrial complex that has shaped for the post-Obama stage the recovery of the role of the US as a world gendarme through the fifth phase of the deployment of the missile shield in Europe (Euro DAM) and an extraordinary increase of US military interventions in The exterior (read New Middle East War). Even Eisenhower, the CIA was only the central intelligence organization for the United States government and was behind multiple tasks of insurgent training and destabilization of governments opposed to Pentagon policies, but the military and financial lobbies (both phagocytosed by the Jewish lobby) could not resist the temptation to create a de facto government that manipulated the intricacies of power, resulting in the emergence of a new entity (Eisenhower's military-industrial complex), refractory to public opinion and to the control of the Congress and Senate of the United States). At present, the company would have been transformed into the so-called Homeland Security and to the Hydra-CIA would have been born 17 new heads in the form of intelligence agencies that would integrate the American Intelligence Community (the Fourth Branch of the Government according to Tom Engelhardt), pathogens of a totalitarian nature, and become a parallel state, true power in the shadow phagocytes by the "Club of the Islands" of George Soros, and that would have been conjured up against a Trump supporter of the Geopolitics Primus InterPares or G3. 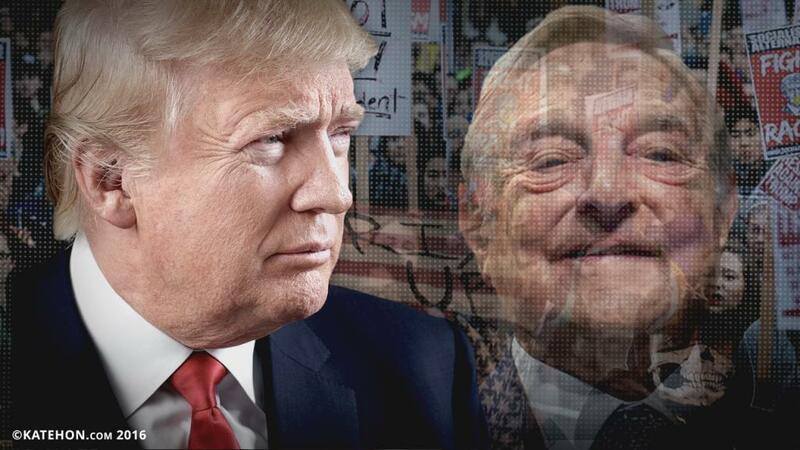 This anti-Trump plot would have been designed following the recent meeting in Washington in which nearly 200 campaigners from Hillary Clinton participated in the so-called Alliance for Democracy (DA), a mega-organization founded by George Soros in 2005. This is the first phase to torpedo the Obama-Trump transfer of powers through a "patriotic or multicolored revolution" in the USA. According to the website Zero Hedge, the spontaneous popular anti-Trump demonstrations would have been inspired by the website MoveOn.org, sponsored by Soros under the motto "Get up and fight for American ideals", and whose second phase would be truncating the political career of Trump, after which Vice-President Mike Pence would assume the Presidency and return to the path of the pseudo-democracies guarded by the true Power in the shadow of the USA (Fourth Branch of the Government).